Our Persian and Himalayan kittens adopted in 2009 to 2012 are featured on this page, as well as comments and pictures that have come from their adoptive families. Families are free to send pictures or give updates on their babies. We have a unique and special relationship with most of our adoptive families. We feel very blessed that our kittens have been adopted by these very special families. Enjoy their cute and sometimes very funny stories. 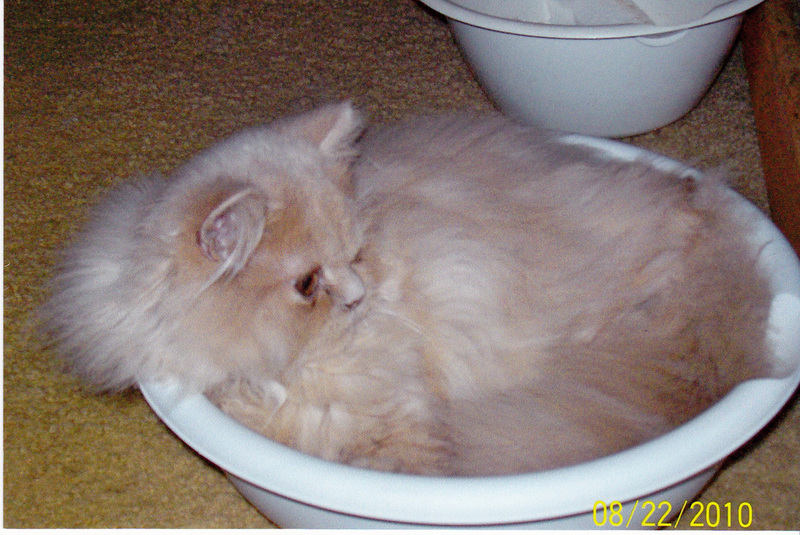 You may click on the picture to see additional pictures of the kitten or view the slide show provided to see the kitten when it was growing up at the Cattery. You can click on the families pictures to enlarge the size of the picture. Sweet Jeremiah describes the personality of this little guy to a tee. He is the sweetest thing. He loves people and looks forward to seeing and playing with you. He is energetic and loves to play for hours. It is fun to watch him play. His fur is long and cream color. 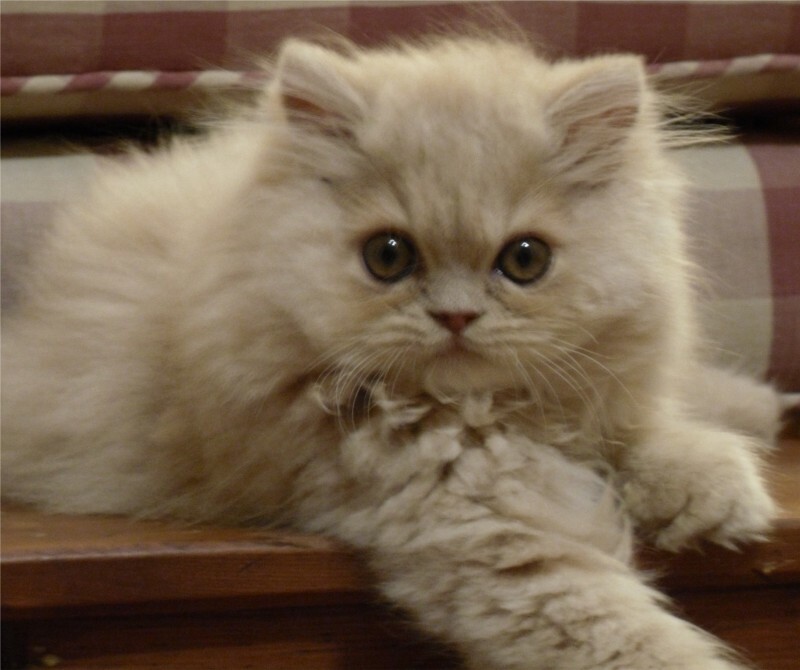 He is a Cream Persian with big perfectly round copper eyes. He has red/brown paw pads. He has the traditional doll face nose. Sweet Jeremiah was born on March 29, 2010 and adopted on June 29, 2010 by April of Chesapeake, Virginia. Jeremiah left an empty hole in our hearts at the cattery. His sister, Peonies really missed him. We had come to love him so much. We could not have found a better mother and home for him than April. April adores him. April fall in love with him over the internet. It truly was love at first sight. When she saw Jeremiah in person for the first time, she said his pictures did not do him justice and he was better than she even anticipated. April calls us to let us know how much she appreciates and loves Jeremiah. We really appreciate her taking the time to let us know how our baby is doing. Jeremiah is her companion and has filled a large hole in her heart. We could not be happier for April. God bless you April and Royal. September 16, 2010: April surprised us at the Cattery and sent to us a large framed grouping of pictures of Jeremiah, which she has renamed "Royal Golden" after her grandfather. She also sent us a portfolio of pictures of him. April can't believe how smart Royal is. He loves sleeping in the bath tub, sink, and dishwasher. She has a ping pong ball in the bath tub for him to play with. She will throw a fuzzy ball and he will retrieve it, but then trots away with it in his mouth to the bath tub. 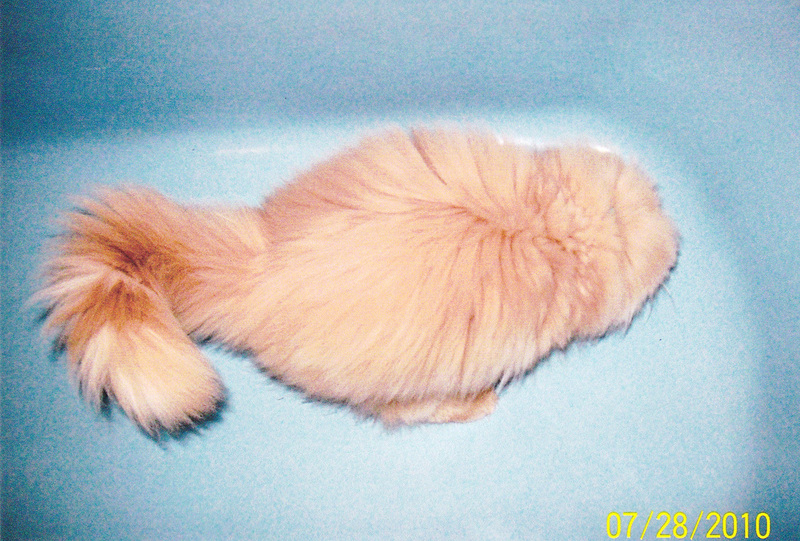 April says he loves the bathtub and running water. He is so fascinated with water that everytime she draws her bath, Royal is right there watching it all. Thank you April for sharing these pictures with us and carrying so lovingly for our little boy.